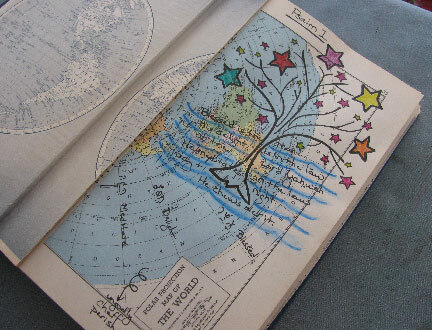 One of the simplest types of altered books that you can make involves cutting out all the pages from a book, leaving a tab of an inch or so. 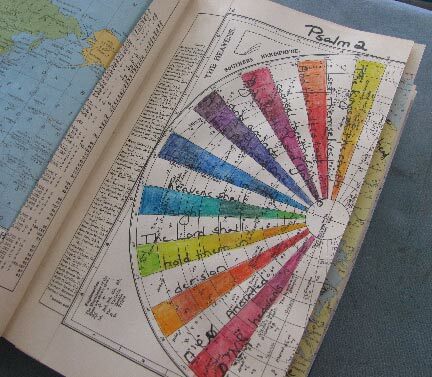 These tabs can then be used in pairs to glue in whatever pages you wish, whether you use the original pages or create new ones from other papers. 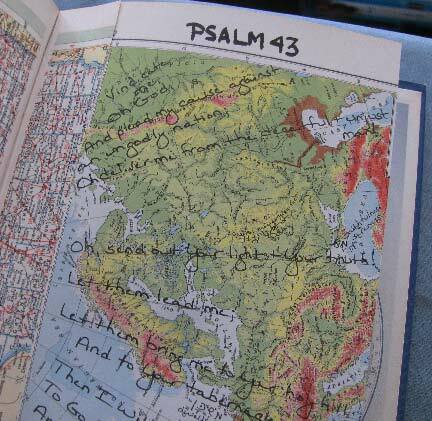 I picked an old atlas with beautiful, but out-of-date maps for my journal. 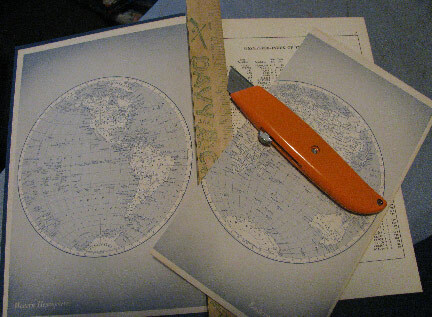 I will end up with approximately half the number of pages as there were originally, which should leave some room for any collaged inclusions. 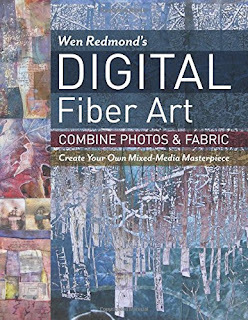 Wen Redmond's book, Digital Fiber Art, published by C&T Publishing, is packed full of more information than you can possibly believe. And throughout, each technique, tip, and idea is decorated by Wen's photos and digital pieces. It's a complete visual feast. 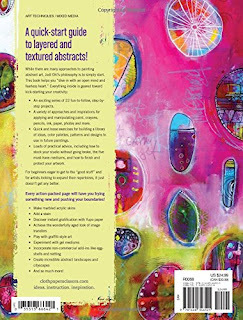 The book begins with inspirational chapters that help you get your images and backgrounds ready for printing and combining. 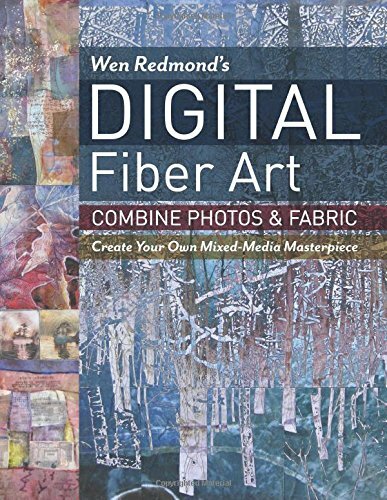 Using digital filters, digital and physical collage, painting papers and fabrics, Wen shows you how to combine these for truly unique results in your art quilts. 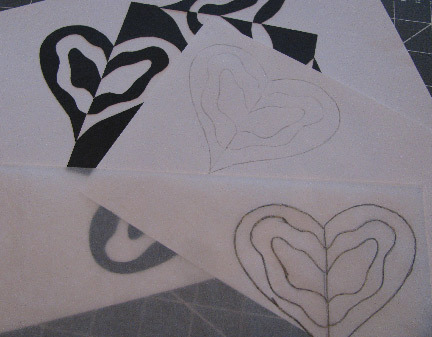 Though she focuses throughout on quilts, so many of these techniques can also be used for paper-based collages. The technical information covers using your printer in some unique ways, pre-coats for your fabrics and papers, making carrier sheets for printing, underpainting and overpainting the substrate, using sheers, recycled fabrics and papers, and various specialty products (like Lutradur). Wen shows you how to include transparent and translucent overlays in your work, plain, printed, and/or painted. She also covers acrylic mediums, especially the specialty ones, and how to add natural materials like tea leaves and sand to your medium. Oh, and don't forget the molding paste and paint skins! Finally, finishing your work is not neglected either, with a chapter on post-coats, sealers, wax, metallic and luster powders. 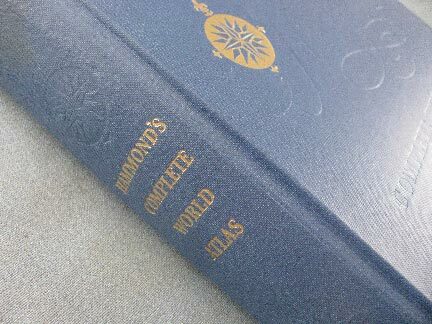 And last, mounting and displaying work rounds out this jam-packed volume. 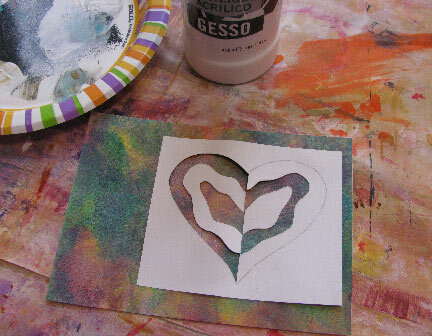 Use foam brushes to pull the paints down from the top with the gesso. 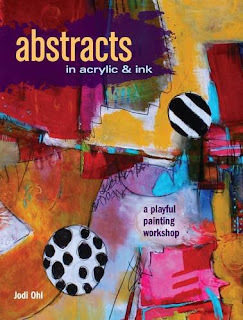 Jodi Ohl's new book, Abstracts in Acrylic and Ink, published by North Light Books, is a great kickstarter for anyone who's wanted to try, but is afraid. 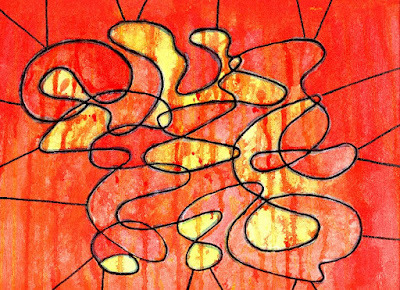 Painting is a dialog, Jodi explains between you and your materials. 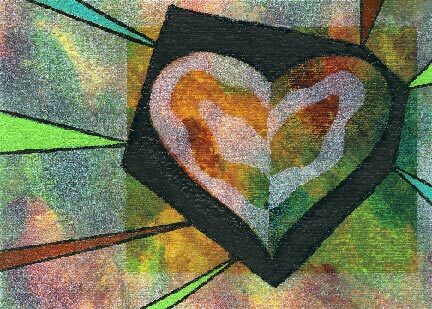 It can be marked by love and happiness, but also by frustration...it's all part of the relationship. Jodi's advice? Get going! Dive in with an open mind and a fearless heart. The entire book is filled with demonstrations, which is very very helpful to someone just getting their feet wet. The first three chapters contain quick and small scale demos. In the first chapter, Warm Up Exercises, Jodi stresses working fast and small to allay your fears, getting past a blank canvas, and using yupo paper as well as watercolor paper. 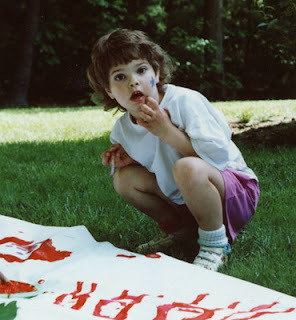 She then turns to understanding painting mediums, including crackle and glazing medium, and making acrylic skins. Next, Jodi briefly covers the elements and principles of design, in preparation for making larger works. 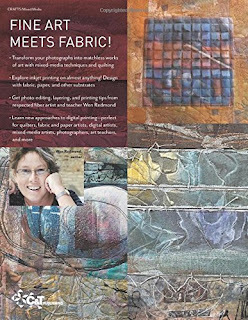 The second half of the book consists of larger works and longer demos, where Jodi steps you through creating landscapes, citiscapes, geometrics, and other completed abstract forms. 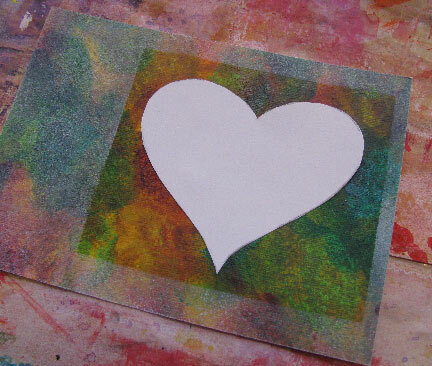 She includes adding inks to your work, adding collage elements, and the all-important task of finishing your pieces. Are you interested in learning how to paint in a realistic fashion, but not slavishly photo-realistic? 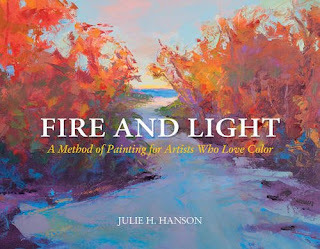 Julie Hanson's new book Fire and Light, published by Schiffer, is gorgeous, encouraging, and very very contemporary in feel. Julie wanted to develop a more immediate approach to oil painting, one that replaced traditional tonal underpaintings with what she calls "temperature painting." She shows you how to build a double primary palette (a warm and a cool) of the three primaries, and how to create your earth tones and neutrals from it as well as your secondaries and tertiaries. 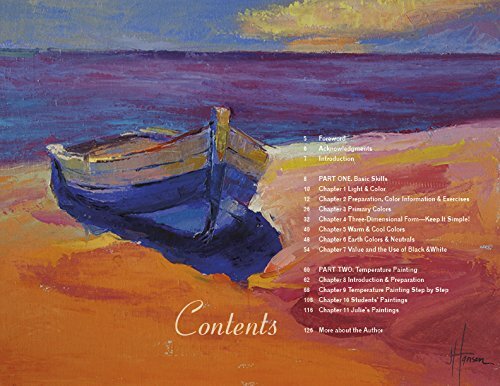 The first half of the book covers basic skills with oil paints and how to use color to build form. There are helpful charts for those who work with watercolor or acrylics...yes, we can do this style too! Part two of the book takes you step-by-step through temperature painting and shows you many many examples of both Julie's and her students' work. Very inspiring indeed. Although I don't do any realistic painting myself, I ended up reading every word and learning an awful lot more than I expected to. If you are interested in realism...don't delay getting a hold of this book! Have you ever been so angry that you couldn't even see straight? That describes me two weekends ago. I don't take it out on those around me...although sometimes I do have to warn people to leave me alone for their own good. Instead, I prefer to take it out on the paints. 1. Pencil a design lightly on the paper (only the inner swirl in this case). 2. Go over it with GAC 100 to give it a raised look. 3. Drip thinned acrylic paints from the top. Allow to dry. 4. 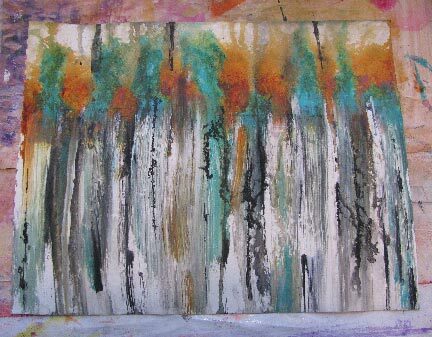 Glaze over sections with colors as desired, allowing the drips below to show through. 5. Use a black Permopaque pen to color the raised lines. You can't see it in the scan, but I also used a turquoise colored pen to color the raised areas not covered by the thin black lines. 6. Add more lines from the swirl outward to ground the piece. Work small and often...and in multiples. That's the take-home message that I received loud and clear from Jo Toye. 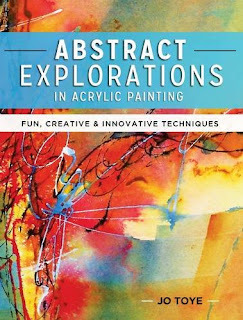 Her North Light book, Abstract Explorations in Acrylic Painting is exactly what I've been looking for, and yet somehow I almost missed it! It was published last March, and I am so so so blessed to have stumbled upon it, almost a year later! Why am I so enthusiastic? Because Jo paints the way I want to paint. 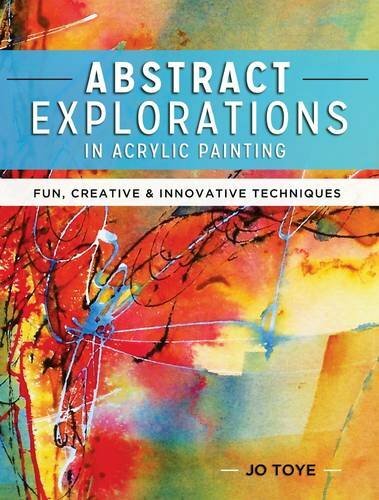 There are many many good books on acrylic painting, and I have reviewed many of them, but this one suits my style, yet pushes me to do better. Jo is an evangelist for line, something that I don't always consider in my paintings. 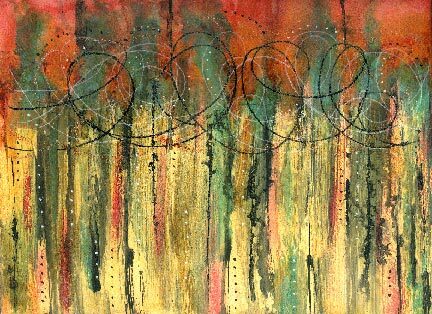 It has always taken a back seat to color and texture in my work, but now I'm reconsidering the error of my ways. 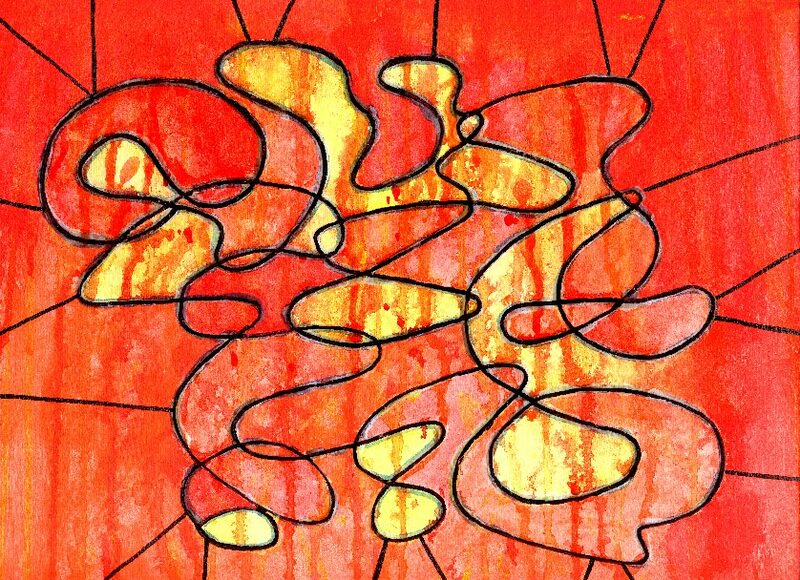 Line work gives vibrancy and direction. Duh. And this is what I was missing. 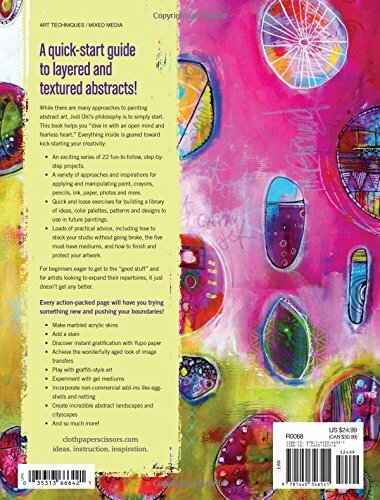 The first half of the book covers the why and the how, while the second half contains eight step-by-step demonstrations to make practice samples for yourself. I am so happy to have a book that goes beyond the usual list of techniques, like splattering, scrumbling, etc. 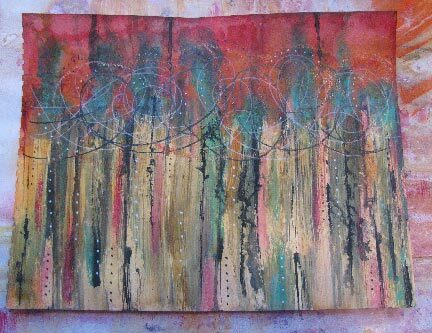 Jo shows you gesso pulls, layered masks, clear tar gel, and much more. Work small and make a lot...these are fun and rewarding. 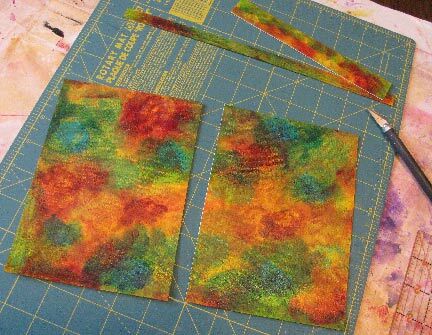 As an example, see the layered mask piece I made at the link, using Jo's ideas!